Bill Gates – consumer champion? Rhys Evans from the Welsh Consumer Council quotes Bill G on customer service – in this case, learning from people when things go wrong. I wonder what gave Bill the idea that there are so many people who don’t like Microsoft? The new organisation we are creating out of the merger of energywatch, Postwatch and National (+ Scotttish and Welsh) Consumer Council will be called Consumer Focus. Long words and good ideas in this online discussion around the Office of Fair Trading on the future of consumer and competition policy. My mate Colin at the OFT tells me they are rarely out of court at the moment. Colin, you’re doing a grand job! 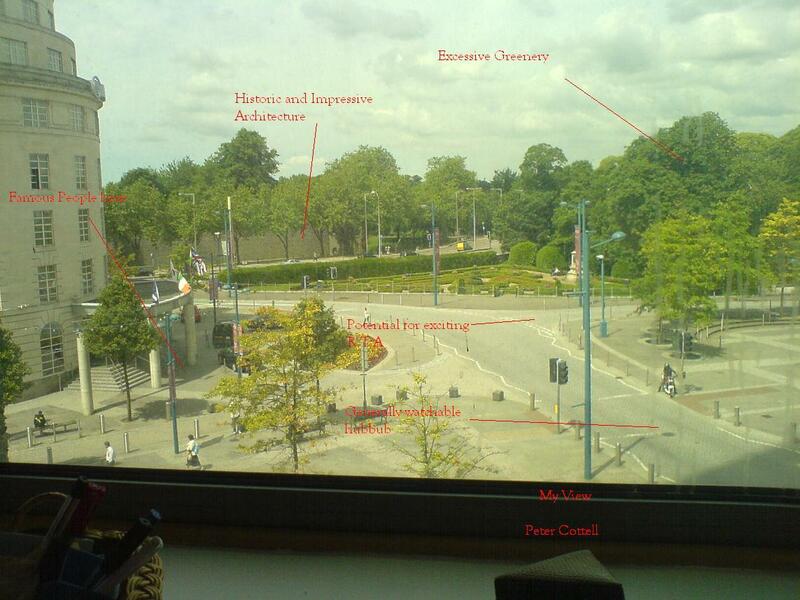 Welsh Consumer Council moved over the weekend to our new Cardiff offices – here is the view from Kim’s desk! It is 100 days to go to our new start on October 1st! A great slot here with Allan on Newsnight on why are energy prices high. I am a proud member of netmums, despite being a patently notmum. They are transforming the consumer scene by doing the simple thing of bringing people together. Have a look at this thread of conversation from a day or two ago on helping someone on how to cope with debt – and how people who have gone bankrupt can touch and support someone threatened with it in ways that no-one else can. It’s self help and mutual aid combined.